The Hitman Summer Pack arrives tomorrow. 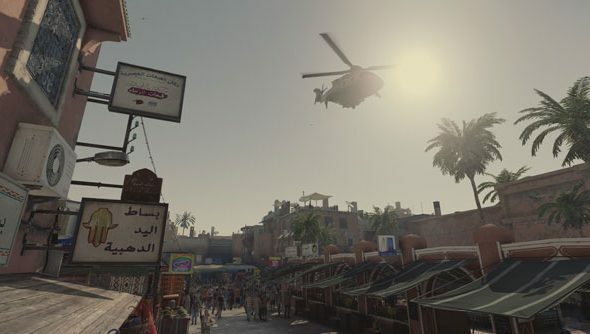 Io Interactive tweeted earlier today, revealing that the game’s third episode, which takes place in the bustling streets of Marrakech, would be included in the pack. Much like many of the other Hitman levels, Marrakech tasks players with neutralising two targets. Swedish banker Claus Strandberg is hiding out in the country’s glittering consulate, which is pretty out of place in the Moroccan capital. While crowds protest outside, your other target, general Reza Zaydan, has taken control of a nearby abandoned school. While Marrakech doesn’t quite match the lofty heights of episode two, Sapienza, Io did a great job of capturing the hustle and bustle of the Moroccan streets, while contrasting them with the calm and quiet of the embassy. Check out our list of the best stealth games on PC. According to the tweet, you’ll be able to download the Hitman Summer pack for free from tomorrow, although Io is yet to reveal exactly when. They also say that the pack will be free “for a limited time,” but it’s not yet known how long that will actually be. The Hitman 2 release date is November 13, 2018, meaning that yes, you’ll get yourself a new Hitman game this year. Unlike the original, however, Hitman 2 is not episodic, which Io says is part of an attempt to bring players better live content. If you can’t wait until November, you can pick up the pre-order to get access to Hitman 2: Sniper Assassin, which is an excellent incentive, and far more than just a token bonus. You can check out some gameplay footage for Hitman 2 from E3 in the video above.